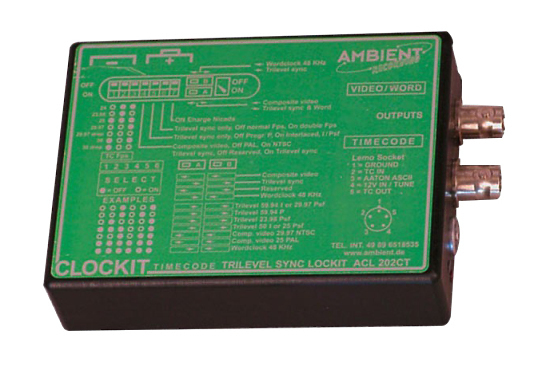 The Ambient Lockit ACL-202CT is a highly accurate portable time-code and video sync generator. Audio and video machines such as DAT, hard-disc, DVD recorders, High Definition and Digital Cinema cameras can be synchronised to the Lockit box, thus insuring very low drift between machines and thus allowing multi-camera shoots to be carried out without time-code cables or radio links. When using the ACL-202CT drift will be less than one half frame a day, giving problem free editing and syncing in Post Production. The Lockit can be used in any recording situation where the accuracy of the TC generators in the different machines is not known and where a cable connection is not possible. Each machine is jam-synced and Genlocked (if possible,) to its own Lockit box which is synced to a common source before the recording start. Dimensions (WxDxH) 2.1 x 3.9 x 1"